Markus Åkesson, Niklas Asker, César Bardoux, Laëtitia Bourget, Apollinaria Broche, Serena Carone, Cécile de Cassagnac, Marion Catusse, Bones & Clouds, Marielle Degioanni, Lola B. Deswarte, Lucy Glendinning, Paul Hazelton, Pascal Haudressy, Sarah Jérôme, Lidia Kostanek, Kim KototamaLune, Agata Kus, Magali Lambert, Mike MacKeldey, Nieto, Camille Pozzo di Borgo, Till Rabus, Benjamin Renoux, Cendrine Rovini, Satoshi Saïkusa, Jonathan Siksou, Carolein Smit, Hideo Takashima, Mitsuru Tateishi, Nikolay Tolmachev, Paul Toupet, Ionna Vautrin, Edwart Vignot, Eric Winarto, Anaïs Ysebaert. Présentées dans une scénographie évoquant les historiques « chambres des merveilles », les œuvres de l’exposition ont cette année pour fil rouge la sentence japonaise d’Ichi-go ichi-e (一期一会), issue de la pensée bouddhiste zen. Traduite littéralement par « Une chance, une rencontre », cette maxime incite à apprécier la saveur de l’instant, car aucune expérience commune ne se produira jamais plus de la même manière. L’invitation fut donc lancée aux artistes, d’entendre à leur façon ce sujet et rendre tangible l’instant parfois déterminant de la rencontre en tant que point de départ de tous les possibles. 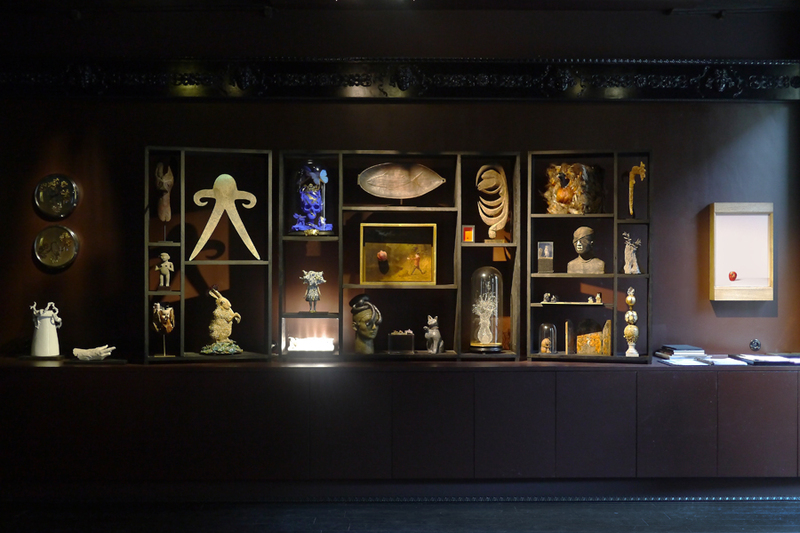 The Galerie Da-End is pleased to introduce this spring its seventh contemporary cabinet of curiosities, a major rendez-vous of the gallery’s annual program and result of a dialogue between the work of thirty international artists and tribal objects. Presented in a scenography reminiscent of the historical « rooms of wonders », the artworks featured in the exhibition follow this year the underlying theme of Ichi-go ichi-e (一期一会), a Japanese maxim that stems from zen buddhism. Literally translated by « One chance, one meeting », this saying encourages each one to fully appreciate the instant, for no common experience will ever occur the same way. The invitation was therefore launched to the artists, to construe this subject in their own way and make visible the sometimes decisive moment of the encounter, as a starting point for all things possible.